The Signals is the newest wireless BBQ thermometer from Thermoworks. It’s available NOW for $229 and comes in 9 different colors. The Smoke came out a couple of years ago and has been the #1-rated BBQ thermometer available ever since. The Smoke is a 2-probe device with a rugged body and a matching wireless receiver that maintains a reliable connection up to 300ft away. Thermoworks also has a WiFi Bridge available to give the Smoke internet connectivity. The Signals builds on the same reliability and trust of the Smoke, but adds WiFi and Bluetooth as well as TWO additional probes. The Signals is a high-quality device that looks and feels like a luxury product. The materials are rugged and durable while maintaining a clean and classy look good enough to hang on the fridge. And that’s exactly where mine will live when not in use, thanks to the 2 ultra-strong magnets on the back of the device. 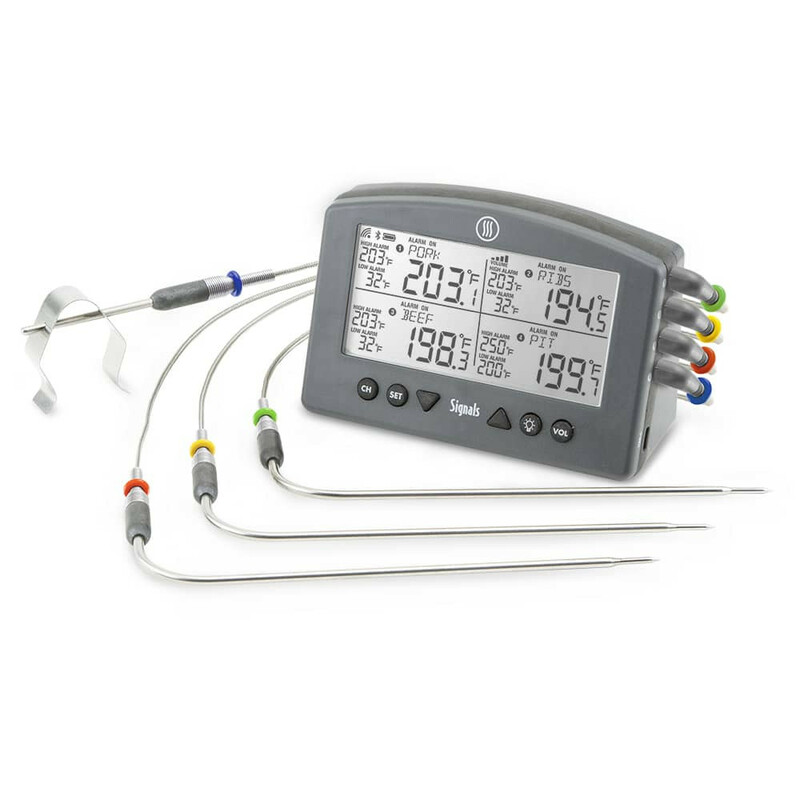 The probes from Thermoworks are 2nd to none. The heavy-duty plug heads have springy support to avoid cable failure and this new device includes color-coded identification rings. I’m not a fan of bluetooth, let’s just get that outta the way. It was designed for personal short-range electronics and is extremely limited by distance, obstacles, and interference. The bluetooth of the Signals is no exception. It’s a line-of-sight type of connection and it shouldn’t be relied on. That said, the Signals is a WiFi thermometer and bluetooth is really only there for you to connect to it and get it onto your WiFi network. After finishing my video I decided to just keep bluetooth disabled. The WiFi settings are easy to configure and super easy to use, although I had to move my grill closer to the house in order to connect reliably – even when my phone and laptop had no issues with the same distance from my WiFi router. I LOVE that its USB-C. This newer version of the USB standard is capable of charging significantly faster than previous versions. There’s not a lot to hate on here. My main gripe is within the App itself. The notifications from bluetooth connecting and disconnecting frequently are enough to drive me mad. This can be solved by disconnecting bluetooth after your WiFi settings have been connected. The Signals is available directly from Thermoworks for $229.